The term thalassemia is used to define various hereditary anemias that are identified by a reduced production of one of the globin chains that form the hemoglobin molecule. Thalassemia syndromes are widely distributed throughout Mediterranean, Middle Eastern, and Asian countries, and occur with a significant incidence worldwide in populations that originated in these regions. The thalassemias probably represent the most common single gene disorder to cause a major public health problem in the world . In the Mediterranean area alone there are more than 200,000 β-homozygous thalassemia patients, and according to the World Health Organization approximately 180 million people are heterozygous for one of several forms of genetic disorder of hemoglobin synthesis . In β-thalassemia there is deficient or absent synthesis of the β-globin chains that constitute the adult hemoglobin molecule. Because β-thalassemia is a genetic disease in which the known expression of the genetic defect is located in the hematopoietic system, it is rationally curable by allogeneic bone marrow transplantation. The first successful transplant in β-thalassemia was in an untransfused 14- month-old child and was reported by Thomas in 1982 . At about the same time a 14-year-old thalassemic patient who had received 150 red cell transfusions was transplanted in Pesaro but had recurrence of thalassemia after rejection of the graft. 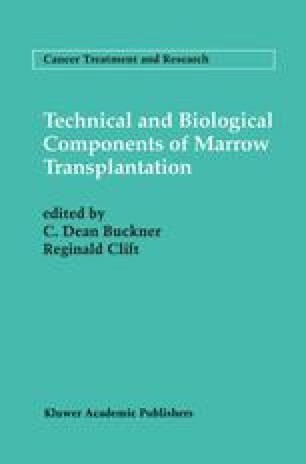 The first report from Pesaro on this topic was in 1984 , and since then several centers have reported experience with marrow transplantation for thalassemia (Table 1).